How to Apply IPO through ASBA? What is the procedure of applying in IPO through ASBA? I am delighted to share my knowledge on how to apply IPO through ASBA with you. If you are seeking how I apply for an IPO through ASBA (Application supported by blocked amount) or how to invest in IPO online through ASBA facility then you are at right place. Prior to the year 2016, it was a common problem in India base of investment whenever any IPO comes in the stock market. The new IPOs or the Initial Public Offers used to raise the money from the public by inviting interesting individuals to buy the shares of the company. The investor has to pay upfront for those applied shares which are not allotted to them yet. The investors do not get the interest even forgiving and keeping their money to the company for the period of waiting time. The refund of submitted money was not guaranteed. The above-listed problems took a deep insight by the SEBI, and then a single solution to all the averse was generated. The name of the solution come s with the “ASBA”. So, stay tuned for this post to know how to invest in IPO online through ASBA facility. How to withdraw your ASBA bids? 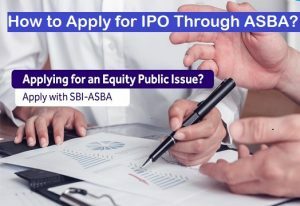 How to apply for an IPO through SBI ASBA? It is an application facility provided by the bank, so automatically, you should have a bank account to enjoy this facility. In the facility, whenever you will apply for an IPO, you can apply through your bank. It means that your expense for the amount to be paid for applying for the IPO will be paid by the bank only, and this will be transacted only when you get the final allotment of shares. Your amount will be blocked in your account and will not be credited anymore until the shares you had applied do not get allotted to you. The bank in which you have your account takes care of this account. For this facility, you have to fill a form, called an ASBA form and submit it to your bank. This would ensure that you are applying for the IPO via ASBA application. They all are Self-Certified Syndicate banks. It means that these banks are authorized to block the IPO application amount until IPO allocations are finalized. This way Issuer Companies are guaranteed that the money is blocked and not used for other purposes. Upcoming IPO in India 2019 How to Invest in Share Market? Best Stock Trading Apps 2019 What are NIFTY and SENSEX? The investor need not pay the IPO the application money in the upfront. Neither has he had the pressure to pay via cheque. Rather, he just has to submit the ASBA form which includes an authorization to block the bank account, to the extent of the application money. The investor need not worry about the refund of application money as it is safe with his bank account and it is the responsibility of the bank also to take care of his money. The money is paid to the IPO only when the IPO has selected the investor’s applied shares and allotted him those shares. The investor is able to earn interest also on the amount which is deposited with the bank for the purpose of applied shares. The investor will earn the interest until the principal amount did not fetch by the IPO for delivering the shares in exchange. The investor deals with a known intermediary i.e. his or her own bank. There are certain regulations by the SEBI for the investors that when they can invest via ASBA. If the investor is applying for the shares or securities up to 2 lakh. Another term used for this investor is Resident Retail Individual Investor. You must have a Demat Account. If the investor is not bidding under any reserved category. If the investor has promised to not revise his bid. If he is applying through the bank which is maintained with the SCSBs. If the investor is not a renounce to the issue. If the investor is holding shares in his Demat form and has applied for entitlements or additional shares in the issue in Demat form. To apply for an IPO, you have two options. Either you can apply offline, or you can go through the online application process also. In an Offline method, you can apply through your bank under your bank account. You have to fill an ASBA form and enter some details carefully. After filling all such details you will have to submit this form to your bank. The bank will hand over this application form to the bidding platform and in this way, your application to apply for IPO via ASBA will be accepted. You will need an online banking facility or the net banking facility attached to your bank account. Sign in to your bank account. In the menu on the left-hand side, you will see a request button, clicking which you will get the link as “IPO Application”. Select the IPO you want to apply for and place the bid. You can mention up to 3 bids. Fill your depository details and then place and confirm the order. Note: you can make up to 5 applications from your bank account per issue. If any of the SCSB banks does not provide you the online application facility, then you can visit the NSE website and get the ASBA e-Forms from there. If you want to withdraw your already made bids during the bid period, you can do so by approaching the bank via which you had applied for the IPO. You have to write a letter making the request, duly signed by you mentioning your application number and the TRS number. If you are wishing to withdraw your bids after the closing of the bid period, then you have to send the withdrawal request to the registrar. Whenever the registrar will receive the request, he will accept it and will cancel your applied bid. He will instruct the SCSB to unblock your application money after the finalization of basis of allotment. SBI or the State Bank of India is always at most choice among the majority of citizens. The bank has the largest customer base all over the nation so it is really necessary to provide the SBI lovers the details regarding the application process via SBI ASBA. 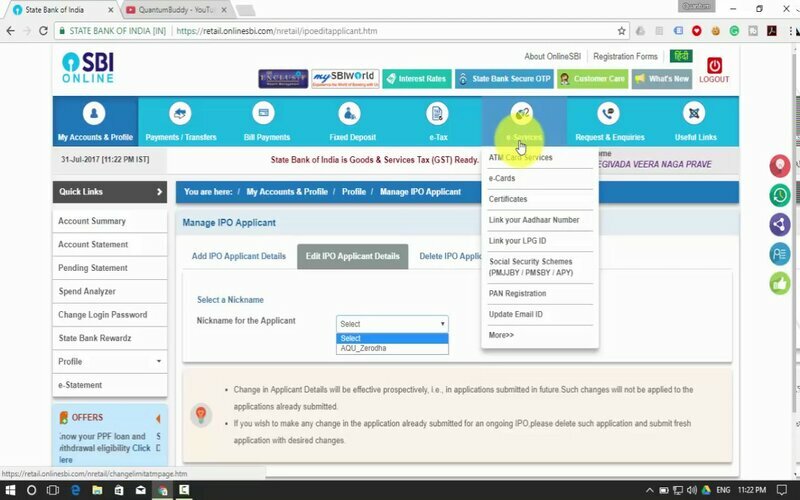 See here, What is the process of SBI to apply for IPO? Go to the e-service tab. Select the Demat & ASBA displaying at the left menu. Under ASBA service, you will see the IPO Equity link. Click to the IPO Equity and click on ‘Agree’ button. Click the IPO you wish to apply for. After this, you will see the details of the selected IPO. Fill in the details like PAN, DP account, bid price, quantity, etc. and click on Submit and you are done. You can check the status by going to the IPO history tab. Note: the same process will be followed for all nationalized banks. This is all about the ASBA process to apply for the IPOs. Please take a note that only the retail investors or the book-built can apply for the IPOs via the ASBA application facility. This is also necessary that you have to apply via that bank only which is SCSB registered. Take care while filling the ASBA application form, because any fault detail can reject your application process. I hope you had a great time reading the above content on “How to apply IPO through ASBA.” After reading this article if you have any doubt or suggestion in your mind, then please write to us in the provided comment box. We will surely answer you back and discuss with you the essentials. Like and subscribe us if you want to hear us in future also. Thanks for reading us. We will come up with another article. Till then, stay tuned with us.